This year's Canadian Open - like last year, one of only four "Super World Tour" events on the Racketlon World Tour - offered record prize money to a record number of participants. The draws published before the event contained no less than 95 entries and the total amount of prize money was among the highest seen in Racketlon so-far; 5500 Canadian dollars. Even the quarter finalists of the Men's A class were guaranteed a prize cheque of at least 150$. 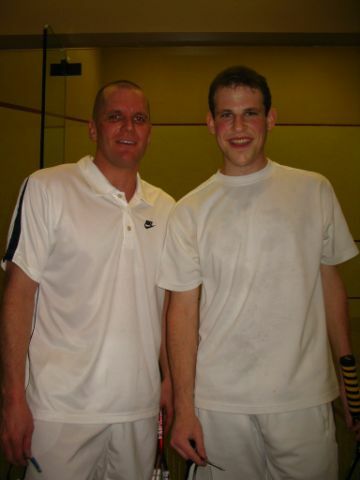 One of Canada's biggest Racketlon enthusiasts and the coordinator of the Canadian Racketlon Tour the highly inspired Jamie Herman gives us a personal flavour below of a tournament that keeps growing. See also some complementary notes in the right margin by Rod Bedard, the strongman of Racketlon in French speaking Quebec and the organiser of several Racketlon tournaments in Montreal - including last year's breakthrough world ranking event (see report). It has been one of the worst winter endings Canada has ever seen. No one was outside since the temperature was as low as negative 25 degrees with 30 cm of snow (approximately 12 inches). Despite that event, the action on the courts was hot and the adverse weather conditions could not deter the anxious and ambitious players to miss their matches. With close to 100 players including international players from Germany, England and Sweden, the tournament proved to be more successful than ever. Tournament director Stephane Cadieux could not have done a better job on this venue and I would say it will be difficult for him to match this for next year. Ask many of the international players who attended. Better sponsors, better dinner, better prizes, same great venue. I would like to begin by discussing mostly the match you guys have been waiting for along with some highlights of matches that I watched. I will discuss some of the Canadian up and comers. As most would predict, Thomson was the winner. During this entire tournament Thomson was at the peak of his games in all his sports. The most surprising was his table tennis. Despite having not practiced much prior to the tournament, it proved to be complementary with his other. This was even in the final match up with Johan. The table tennis started with many eager watchers. The umpire sat down and instructed them to begin their match and the tension was so thick you could cut it with a knife. Thomson wins the ball choice and chooses to serve in table tennis and squash. Thomson starts off strong with his top spin serves on Johan who was blocking them giving Thomson some easy killers. Points were exchanged back and forth continuously as Johan kept serving no spin or light top spin serves giving Thomson an easy chance to keep the ball in play. Many predicted Johan would beat him handily in table tennis, but to everyones surprise Thomson had won 21-18 and shocked the crowd. I was shocked, but I must admit that Thomson was playing an excellent game of table tennis and was highly concentrated. He played the right serves at the right time and capitalized on all his opportunities. I only wish I understood what Johan was saying in Swedish. This set the tone for the rest of the match. Everyone knows Thomsons strength is the next three sports and since he had to also play the final of the Canadian Doubles Squash Championships at 3pm while it was currently 1pm, he was not going to give Johan any mercy. Badminton began and Thomson got off to a quick start leading at the half mark by 11-4. In the first half Johan served two birds short and Thomson faked a deep shot and dropped catching Johan on his feet. Thomsons incredible backhand clears, drops, and smashes completely took Johan by surprise. However, in the second half Johan began to understand his game a bit more and read the drops, backhands, but could not keep up with his pace. The result was 21-8 in badminton in Thomsons favour. Seeing as how Thomson is undefeated in squash, we could all see where the match was going. Everyone crowded around the squash courts before the match began because Thomson is always a treat to watch in squash. The match begins. Johan hits a backhand slice drop into the forehand corner, Thomson retrieves it and puts it back to him. Johan hits the same shot again and Thomson retrieves it. Johan hits it a third time and gets the first point. Thomson then knew it wasnt time to joke around. He played a very traditional game of hard hitting length and deep lobs keeping Johan all over the place and diving from side to side. At the half point the score was 11-4 and Johan came off the court huffing and puffing. In the second half it seemed as if Thomson was playing with him because he knew he had the match in hand and had long rallies. One even went on for about 2 minutes and resulted in Johan leaping to get the ball in the back and hitting tin. He got up, looked up, the referee said the score and he said, Theres still more? with a big grin on his face. Surely enough, the next rally went the exact same way by Johan truly fighting for every point win or lose and I highly respect his game for this. The set went 21-5 in Thomsons favour resulting in a win of +31 without needing to play the tennis. A great match I would say, but the table tennis truly hurt Johan because he could not get to his best sport. After the match, the award ceremony was held with great prizes for the winners and well spoken speeches by Thomson and Johan. Thomson then hurried off to his other finals match. I didnt watch much of the Thomson-Håkansson match but I saw he broke his strings during his badminton match and was not happy with his replacement. I made it a point, though, to watch Thomsons first match against a German player who was the best badminton player I have ever seen live. He beat Thomson 21-1 and lost that point only because he broke his string during the point making the racket unstable. None of Thomsons shots were a threat to him and he even tricked Thomson on many occasions. The look on Thomsons face after the badminton was priceless since I dont think he has ever lost that bad before in badminton. I later learned this player was #3 in Germany 3 years ago. His other sports though were not as complementary and he lost to Thomson in table tennis which is a bad start. The last highlight I want to mention was the Peersman-Pintea match up in table tennis. 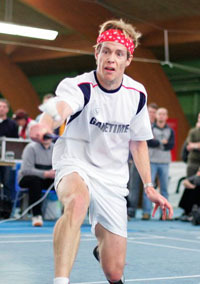 Having hit a bit with Peersman before his match, I could easily tell why he played in some of the top Belgium leagues. Perfect form with short spinny serves for good set-ups. The match began and everyone was watching for obvious reasons. Having played Pintea in table tennis before, I knew that his serve would give Peersman some difficulties. In fact, in the whole set I think Peersman only returned half of his serves on the table. And those landing on the table seemed to be an easy put away for Pintea. Peersman was having a tough time hitting nets and missing all his loops. The shocking result was 21-3 for Pintea! Speaking to both of them after the match I recall Peersman saying, This was the worst table tennis I have every played in my career. Pintea's response was, I played pretty good, I felt like I was hitting the same shots back as when I was playing in the top leagues. This gave Peersman a rough start giving Pintea the win overall. Lastly, I want to discuss some of the Canadian players who seem to have strong potential for future years in Racketlon. As many know, Canada is strong on their squash so this tournament had attracted some of the best squash players around Ontario. And there was a significant amount of players who play at the level of Thomson in squash in the B draw, yet not fully developed in the other sports. Many of them inquired to me where to receive training for their other sports, so perhaps with some time and determination, you might see players such as Alex Carter, Omar Samad and Jonathan Madruga moving up fast in the Canadian Racketlon world. Overall, I will again mention that the tournament was excellent as usual and I could feel such camaraderie with everyone by the end of the tournament. This is one of the key features which makes Racketlon such a good sport, the attitude and sportsmanship of all the players involved. A special thanks goes off to all the international players who came to enjoy our venue. I now know everything that the international players go through to play since I recently crossed the Atlantic myself to go to the World Championship. I also want to thank Stephane Cadieux and all his volunteers at the club who made this event such a success. I assure you that we are taking all measures to ensure that next years venue will be even more spectacular! Complete results are expected to appear on the tournament homepage within the next few days. Thanks to Johan Porsborn for timely result reporting. The look-alike. Jamie Herman with his first round opponent in the Men's Class B. Members of the Gothenburg Racketlon community will find it hard to believe that the guy on the left is not Håkan Granberg (the legendary tournament director of seven Gothenburg Opens including Racketlon's first three World Championships) but James Dye! It was a great tournament with a lot of improvements since the previous editions. They had better sponsors more volunteers, more players, more free beer at the banquet and better prize money. to make sure we start our match on time, the slower players (myself being one of the worst) were reminded to stop practicing and start the game. Everything seemed to be on time thanks to the floor managers and good scheduling. -The presence of an international badminton player (Conrad Hueckstaedt), both Richard Thomson and Jeremy Easterbrook the other two top badminton players lost heavily 1-21 and 4-21 even though the rallies were well contested. - Horatio Pintea displayed great form to sail above the competition in the O-45 event. His table tennis level is scary once again as seen by Mr. Peersman. Horatio Pintea. Best tt player on the tour? - Jamie Herman, who is an eternal "B" finalist or winner, will finally have to move up to the "A" division after his win this weekend. Albert Wong, a two times finalist in "B" must seriously consider moving up to "A" also. - The traditional Saturday night meal was followed (by some) by a night of intense action at Scallywags - the sponsoring pub. Some players had a reality check when their next match started early Sunday morning. I have names but I will not divulgate them in order to protect my sources!!! Congratulations to Richard Thomson who is in a class of his own. I think he is unbeatable if he wins the table tennis. Many thanks to Stephane Cadieux who, even under constant pressure, is always kind with the participants and manages to stay on top of events. See you next year in Toronto! - reporting from Toronto via Montreal.